Wes Anderson’s stylised soap opera, The Royal Tenenbaums, tells of prodigal patriarch Royal Tenenbaum’s (Gene Hackman) attempts to reconcile himself with his family. He walked out on them some 20 years before for reasons that remain obscure except for his claim that he was kicked out by his wife, archaeologist Etheline (Anjelica Huston). He left behind three child prodigies that have grown up into businessman Chas (Ben Stiller), tennis player Richie (Luke Wilson) and an adopted daughter, playwright Margot (Gwyneth Paltrow). Once a wealthy lawyer, Royal is now disbarred, broke and recently evicted from the hotel he has been living in since leaving the family. He decides to return to the family home in spite of having had no communication with them for three years. To convince them to take him in, he tells them he has six weeks to live. In his absence the depressive Margot, whose writing career is faltering, has married repressed scientist Raleigh St. Clair (Bill Murray) while also carrying on an affair with a drug addicted writer and family friend Eli Cash (Owen Wilson). Chas, recently widowed, is suffering a nervous breakdown that takes the form of overprotective behaviour towards his two young sons. Richie has given up a brilliant career in tennis to nurse his unrequited love for his adopted sister. Most alarmingly for Royal, his wife is contemplating marriage with the family accountant (Danny Glover). Although Royal’s ruse is soon discovered and he is ejected from the house again, he realises that he really wants to regain his family’s love. He successfully does so by solving their problems – granting Etheline the divorce that will allow her to remarry, getting Richie and Margot together, making Chas relax and loosen control over his sons. The Royal Tenenbaums opens with an image of a book – ‘The Royal Tenenbaums‘ – being checked out of a library and is punctuated throughout with shots of chapter headings from this book, splitting the film into ‘chapters’. The message is clear: we are not engaging with a naturalistic reality here, we are having a story read to us. This storybook anti-naturalism is pursued rigorously throughout every aspect of the film. Its carefully controlled look favours a chocolate box colour scheme and a precisely controlled mise en scène. The characters are distillations of their defining characteristics, subtly exaggerated caricatures. They are shown to exist only in relation to the family. Any glimpses of lives led by members of this clan outside the womb of the Tenenbaum family residence are distorted through caricature to the point of unreality. The overall impression is of a story for children, listened to by children whose perception of the world has not yet extended beyond the space of their family environment and whose understanding of adult character is still somewhat broad. This is an intriguing and appropriate approach to a story in which many of the characters are prisoners of their childhood, either attempting to escape or regain their pasts or engaged in trying to create a childhood for their own children free of the problems which marked their own upbringing. This constant harking back to the Tenenbaum kids’ childhood is highlighted by a pleasant, late ’60s dominated soundtrack. Unfortunately, having created this original and interestingly stylised universe, Anderson frustratingly fails to put it to any better use than to tell his story in the safest, most obviously calculating manner possible. His relationship with the audience is that of an adult reading to the viewers who, he assumes, sit like children on his lap, hanging off his every word. But, like many adults telling children’s tales, his attention is constantly trained on the child’s reaction with the twin preoccupations of satisfying his ego that he is constantly impressing the listener and, most importantly, never saying anything which might cause any discomfort or be even remotely disturbing. The most irritating thing about this film is its constant need to comfort – scene by scene not one bad thing happens that isn’t immediately, mechanically alleviated by humour which acts in this film as the reassurance that no real harm has been done. These scenes add up and, long before the closing credits, the realisation sets in that a mushy happy ending is inevitable and all the audience has to do is sit around and wait for it. The trouble with all this reassurance is that it keeps the characters at arm’s length from the audience with the ultimate result that the characters are fatally trivialised. A good director of character based cinema will, through any number of methods, bring the audience into the emotional world of the people being dealt with. By undercutting our exposure to his characters’ suffering through this constant emotional reassurance, we are given no opportunity to engage with them and they remain abstract. Any feelings we might have for them are closely mediated by the intrusive presence of the director/storyteller. Anderson seems so terrified of not giving his audience exactly what they want that rather than bringing us into his story, he gets between us and the action and, on a moment by moment basis tells us not only exactly what to feel but how much to feel it and how long for. He leads us by the hand, like children, eliminating all troubling ambiguity, highlighting the amusing idiosyncrasies of the people who inhabit this world in an effort to neutralise the distressing emotional violence they live with. And when this fails, he simply covers everything in view, heartwarming and upsetting alike, in saccharine. Anderson’s authorial stance may very well be unique in film history: self assigned protector of the audience, protecting them from the story he is telling. This ‘protectiveness’ smugly subordinates the characters to the pyrotechnics of Anderson’s storytelling prowess, the real raison d’être of this film. For the first half-hour he almost gets away with it. The introduction of his wacky group of characters, played by an interesting cast, promises much. Yet as the film progresses it becomes apparent that this is as far as it goes: the characters do not develop sufficiently and the actors remain helplessly straitjacketed in the one-dimensional mannerisms Anderson has assigned them. Take for example Royal Tenenbaum played by a simpering but still authoritative Gene Hackman. He is a potentially fascinating character, charming, brutally insensitive, opportunistic, fun loving and more of a child than any of his children. For the first half of the film his attempt at reclaiming his family is simply the result of his sudden homelessness. Then, halfway through, when his story about dying in six weeks is revealed to be a ruse and he is sent packing, we are told in voiceover (to the surreal accompaniment of a section of Bob Dylan’s Pat Garrett and Billy the Kid score) that he realises that he really loves them and wants to make amends. He proceeds to do this with predictable success, nobly sacrificing his wife to her new suitor. The trouble is there is no perceptible difference between Hackman before and after his change and this irritatingly complete reformation. Nor is his change in character dramatised. A character has completely changed in an instant and we are expected to simply accept it. Like every other theme and event in this film, it is stated, not dramatised or otherwise explored. This is the root of the film’s dramatic and emotional falseness. It pretends to be about a human situation, but it is content with simply cataloguing a series of events in a way designed to show off the smartness of its author instead of the feelings of its characters. Had Anderson chosen a less simplistic approach, the results could have been fascinating. To stick with the example of Royal, imagine what a rich film it could have been if Royal hadn’t changed but had managed to regain his family, who had accepted him faults and all. Or if he had reformed to the extent of genuinely loving his family, but still managed to break up his wife’s affair and get her back. Or if he had been rejected by Chas right up to the end. Or if the film had dared to state that Royal is an irredeemably flawed person, but has charm and a great relationship with his grandchildren and still needs and deserves love as much as anyone. Almost any alternative options, whether played straight or for laughs, would have been more interesting and, in human terms, more logical than the ones Anderson chose. Logical in that they would stem from the character as opposed to some politically correct crowd-pleasing impulse to, however implausibly, tie up every emotional loose end. This is true not only of Royal’s character but any of the potentially interesting plots buzzing around the Tenenbaum home. But once Royal makes good his reformation, it becomes inevitable that this film will hold no surprises – Richie and Margot will end up together, Etheline will remarry, Eli will go into rehab, Chas will be reconciled with Royal. The result is slightly indecent, as if Anderson, like a gloating ringmaster at a freak show, had kidnapped his characters and forcibly inserted them into a story that was not their own but designed to please a public hungry for cheap sentiment. Among the actors only Luke Wilson manages to suggest something beyond the mannerisms he is asked to embody. The extraordinary, time bomb stillness of his performance and the physical appearance of Gwyneth Paltrow are the only items of genuine interest in this otherwise sterile film. Of course, there is nothing wrong with extreme stylisation of performance or characterisation, or in distancing the audience from the drama. But there must be a purpose to it and the only purpose discernable here is to highlight Anderson’s ability to push buttons in his audience, a celebration of the neurotic, limiting control he exerts over both the film and the viewer alike. 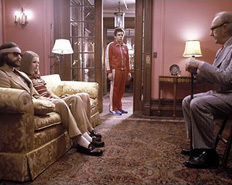 Unlike its characters, The Royal Tenenbaums remains emotionally crippled to the end.